In 1815 a group of promoters who were considering providing a canal from the River Arun to Portsmouth, approached the Admiralty for approval. The Admiralty consulted Charles Rennie, who was in favour of the project and when asked for advice by the promoters, employed Francis and Netlam Giles to conduct a survey. Rennie then recommended a barge canal, 33ft wide and 4ft 6in deep, 12 miles long from the tidal Arun at Ford, to Salterns near Birdham, in Chichester Harbour, with four locks (two at either end) and a 11/4 mile branch from Hunston to Chichester. The route from Salterns was via Thorney Channel, Langstone Channel and Langstone Harbour to enter the Portsea Canal at Milton. The Portsea Canal was 2.5 miles long, with two locks at Milton, and ran across Portsea Island, to a basin at Halfway Houses, Ports mouth. There was also to be a 1.25 mile cut across the top of Portsea Island, via Cosham, giving access to Portsmouth Harbour. The promoters obtained their Portsmouth and Arundel Canal Act in 1817, but the first sod was not cut until 20 August 1818 at Ford. Work also began at Merston on the Chichester section in September, and must have been considered of more importance, as the Ford-Hunston section was opened last. Chichester Canal basin was filled with water on 27 December 1821, and the Chichester Canal opened on 9 April 1822. Next came the Portsea Canal on 19 September 1822 and finally the 9.5 mile Ford to Hunston Section was opened on 26 May 1823. The company had two pumping stations, at Milton top lock and at Ford top lock, to provide water to the two summit levels. Unfortunately, they had problems with salt water entering the canal and percolating into local water supplies. The problem at Milton was so serious that in the end the company was forced to drain the Portsea canal. Ford canal Bridge at the entrance to the Portsmouth and Arundel Canal. It was demolished in 1930. 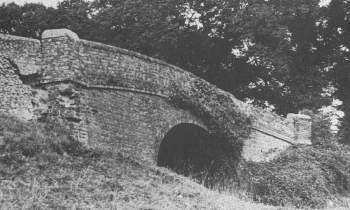 As a result of railway competition, the Ford-Hunston section of the canal ceased to be used after 1847. Traffic on the remaining section of the canal, from Salterns Lock to Southgate Basin, Chichester had fallen to about 4,000 tons in the 1880s and in 1888 a group of shareholders applied for an order to wind up the company. The order was granted and following an Act of Parliament in 1892, the Chichester Canal was transferred to Chichester Corporation. Trade gradually dwindled even more, and the last commercial traffic used the canal in 1906. In 1928, the canal was finally abandoned, but the section from Salterns Lock to Manhood End was re-opened in 1932 for yacht moorings. In 1957 the canal was sold to West Sussex County Council for £7,500.